Can't get enough of this way out school where everybody sings and everything's cool! It's the first day of school, and new students Michael, Michele and Junior are about to discover what the singing is all about. The principal is quite cheery and loves to vocalize!? Everyone's a winner in Jim the Gym teacher's gym, and those classical cooks of the cafeteria are always ready to dine. Even the students in detention are singing . . . the blues, and the whacky Science class is really rockin'! 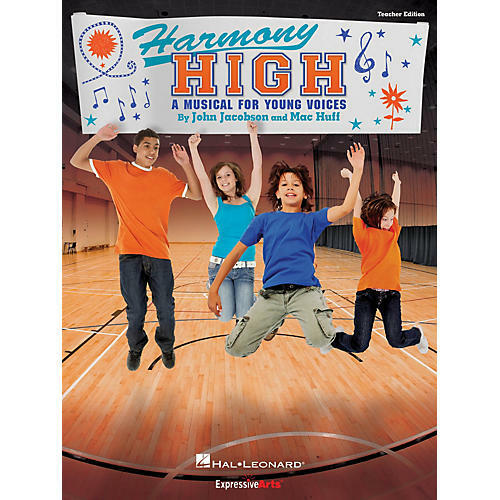 Upper elementary and middle school performers will rock to Harmony High. Clever original songs, zany antics and creative script writing combine for a truly spectacular moment on stage that will have everyone singing, including the audience! Teacher Edition includes piano/vocal arrangements, script, choreography and helpful production guide. The script with over 20 speaking parts is adaptable to groups of varying sizes, and teaching objectives linked to the National Standards are provided for each song. Singer book offers vocal lines and script parts, and the performance/accompaniment CD features the highest quality recordings. The expanded Performance Kit provides all you need in one convenient package for extra cost-saving value. Available separately: Teacher Edition, Singer 5-Pak, Preview CD (with vocals), Preview Pak (1 Singer book, 1 Preview CD), Performance/Accompaniment CD, Performance Kit/CD (Teacher, 20 Singer books, P/A CD). Duration: ca. 40 minutes. Suggested for grades 4-8.